under Singapore's harsh weather conditions. it also meant that we do not own a car. and no fun at all. and this happens to be our first! Simply Adore the Picnic Basket!! My kids proved me otherwise! 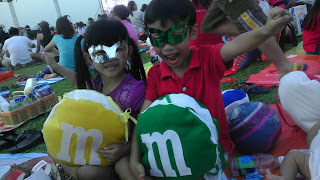 Truly enjoying themselves under the disguise of Superheros. 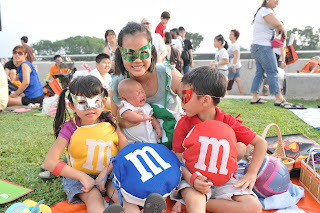 Plenty of activities planned by NTUC Ufamily to keep the kids really busy. "We are young", "Pricetag" and many more. She even attempts to do a sing along! We even won 2nd prize for Best Dressed Family. It's a pity that daddy had to work that day!! But, we'll be back for more picnic fun!